All bookings are final, no cancellations or refunds. Security deposit of half the total amount is required. Pineapple Park Kona is located above Kealakekua Bay, offering one of the most pristine kayaking, diving and snorkeling adventures in Hawai'i. We're also located only ten minutes away (by driving) from the City of Refuge, the archaeological site, Honaunau 'Two Steps', snorkeling/diving area, and the popular sandy beach of Ho'okena. We also have manta ray snorkeling with a special rate for guests (only $80!). A leisurely drive north allows visitors to explore the many beautiful beaches along the Kona coast. A mini-mart, restaurants and a public bus stop are located directly across the hostel. A supermarket, several art galleries, cafe's, restaurants, a coffee and/or chocolate plantation tour are located only one mile away. Our guests really enjoy the community kitchen and being able to cook their own fresh and healthy foods every day. They often enjoy their meals when watching the Hawaiian sunsets from our large, upstairs lanai overlooking the Pacific Ocean. There is also a community BBQ grill area to encourage socializing and the beginning of new friendships! Office Hours: 08:00 a.m. to 09:00 p.m.
No late check-in after 9:00 P.M for Dorm Rooms. *Public bus runs from Kona Airport to hostel at 4:50 p.m. (Mon-Sat). Weekly/Monthly Rates Available. Please call or email us for more information. A cancellation is required 2 weeks prior to arrival to wave any sort of fee. Except the deposit taken by Hostel World. 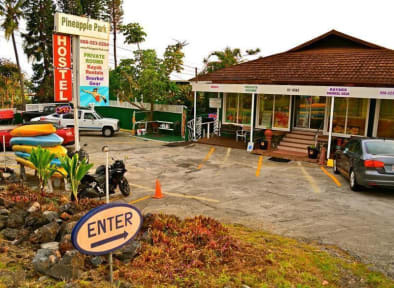 Pineapple Park is not related to or responsible for any deposit taken by Hostel World. 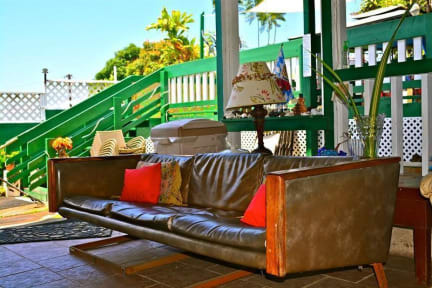 If a cancellation is made less than two weeks prior to arrival the guest will be charged one night's stay - plus tax. And the deposit taken by Hostel World. Special Policy: During times of high volume occupancy - Iron Man Week (from October 7th to October 14th), Thanksgiving Week, Christmas Week, and New Years Week- a 30 day Cancellation notice is required to wave any fee, except the deposit taken from Hostel World. In the Event that a guest cancels their reservation less than 30 days in advance to their arrival they will be charged the full amount of their reservation. In addition to the deposit taken by Hostel World. We had a great stay at the hostel!!! This place is great,very relaxing and the food in the restaurant is delicious. Even good accessibility without a car, the busstop is right at the frontgate. Great and cozy hostel! It is how a hostel should be; warm, clean, good facilities (kitchen, laundry, snorkle gear etc) and hang out places with a nice view and local decoration for the travellers. Only little bit strict on the rules/policy, so don't bring other people in if they are not a guest and grab your stuff from the kitchen before 22.00 and take a shower before 22.00. (kitchen / shower closed). Nice hostel to stay for max 2 nights. Not much to do around there. Got back in late, kitchen was closed, so no dinner for me that night. Annie, the owner, is very Nice.